As the title suggests, this book is dedicated to producing healthy, delicious meals with minimal effort. 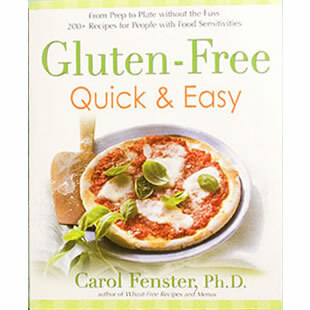 Fenster emphasizes the use of “flavor-intensive” ingredients, such as fresh herbs and citrus, to keep gluten-free meals satisfying and delicious, and outlines time-saving tips like doubling a recipe to help create a second meal. The book also includes storage suggestions and helpful menu suggestions to aid the reader in meal planning. Try the Oatmeal Cookies with golden raisins for a healthy snack or even as a breakfast treat with a cup of tea. We also made the moist and fudgy Chocolate Bundt Cake and got rave reviews from our tasters. 1. Preheat the oven to 325°F. Generously grease a 10-cup nonstick (gray, not black) Bundt pan; set aside. 2. In the large bowl of an electric mixer, beat the oil, eggs, milk, and vanilla until well blended. 3. Whisk the cake mix and cocoa together in a bowl. On low speed, beat the cake mix and cocoa into the egg mixture, alternating with the hot coffee, beginning and ending with the dry ingredients. Transfer the batter to the prepared pan, smoothing the top of the batter with a spatula. 4. Bake 45 to 50 minutes, or until the top is firm and a tester inserted into the center of the cake comes out clean. Cool the cake in the pan on a wire rack 10 minutes. Remove from the pan and cool completely on the rack. Chocolate Cupcakes: Generously grease a standard 12-cup muffin pan, or line with paper liners and spray the inside of the liners with cooking spray. Pour the batter into the prepared cups, dividing evenly. Bake in a preheated 350°F oven 25 to 30 minutes. Having a mix on hand saves precious time when you need a cake and you need it quickly. All you have to do is add the liquid ingredients, beat, and bake. If you don’t need this much mix, you can halve the recipe. Place the ingredients in a sieve and sift into a large, heavy-duty food-storage bag. Seal the bag securely and shake vigorously 2 minutes. Store the mix in the pantry, refrigerator, or freezer for up to 3 months. Stir all ingredients together with a whisk. Store in a heavy-duty food-storage bag or a food-quality plastic container. This recipe can be doubled to make 8 cups or tripled to make 12 cups. 1. Preheat the oven to 350°F. Line a 10 x 15-inch nonstick (gray, not black) baking sheet with parchment paper. 2. In a food processor, process the butter, egg, molasses, and vanilla until smooth. Add the cookie mix, baking soda, cinnamon, and nutmeg, and process until smooth. Add the oats, raisins, and nuts and pulse a few times to blend the dough. Shape 18 balls of dough with a #50 metal ice-cream scoop and place the balls at least 2 inches apart on the prepared baking sheet. 3. Bake 15 to 20 minutes, or until lightly browned around the edges. Remove the baking sheet from the oven and let the cookies cool 10 minutes. Transfer to a wire rack and let cool completely. Fix this quick mix and you’ll be ready to make cookie at a moment’s notice. Whisk all the ingredients together in a heavy-duty food-storage bag or a food-quality storage container. Shake the container 2 minutes to thoroughly blend the ingredients. Store in the pantry or other dark, dry place.